The City of Crystal is completely renovating its popular Becker Park in the heart of the City's downtown. The new park will include an upgraded inclusive play area, performance lawn, multipurpose space for farmer's markets and gatherings, and a 72,000 square foot underground stormwater infiltration gallery. Large half round rigid plastic pipes are paced on a gravel bed and covered in soil. Stormwater will be diverted from a storm sewer that runs through the park into these interlinked pipes, which will hold the water until it can infiltrate, or sink into the ground. Sediment and pollutants will be collected in an initial row of pipes that can be cleaned out periodically. This will reduce nutrients and sediment flowing through the storm sewer to Upper Twin lake to the east. This project will be completed in 2019. Stormwater treatment ponds have become a familiar sight in Minnesota. Sediment and other pollutants in stormwater settle to the bottom of the pond instead of in lakes, streams, and wetlands. However, because they rely on settling, these types of ponds don't work very well at removing pollutants that are dissolved in the water. 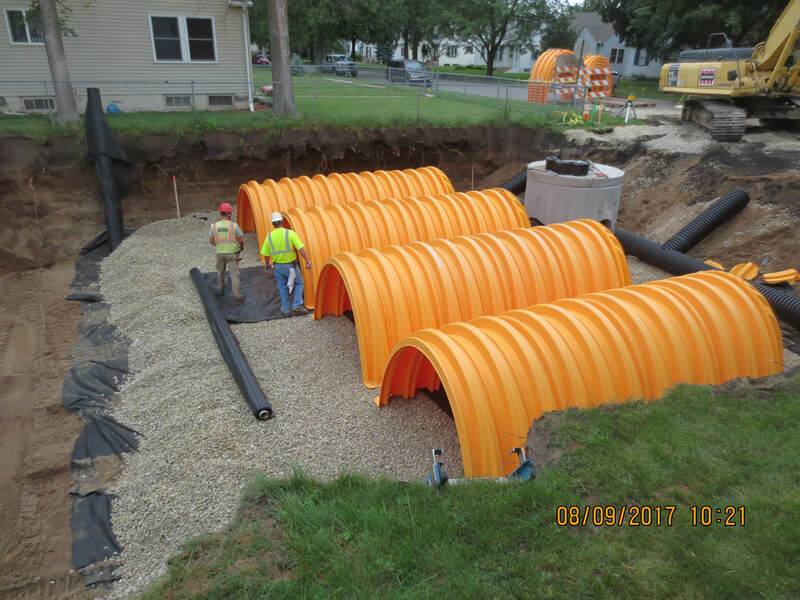 The University of Minnesota found that passing stormwater through a sand filter enhanced with iron filings would remove dissolved phosphorus, and developed a standard design for a filter bench that could be added around stormwater ponds to increase treatment. Recent research at Stanford University found in the lab that adding biochar, a special type of charcoal, to the iron-enhanced sand filter would also remove bacteria in runoff. The Shingle Creek and West Mississippi Commissions received a federal grant to field test these filters in several locations. These will be constructed in 2017 and monitored for two years. A Minnesota Filter rings this stormwater pond. When the pond level rises, water passes through the filter, where the iron filings help remove dissolved phosphorus. The limestone that fills this overflow weir box at Wetland 639W in Crystal will be modified as part of this project. It will test how well various various filter media reduce the concentrations of dissolved phosphorus in wetland outflow. Wetlands that have received many decades of nutrient and sediment-rich runoff from agricultural and developed land uses are at risk of transforming from nutrient sinks to nutrient sources.The hydrology of these wetlands has also often been altered by inflow from increased runoff volumes and ditching for drainage and flood prevention. This can have the effect of alternately flooding and drying out the wetland soils, making them more susceptible to sediment nutrient release under anoxic conditions. The discharge from these altered wetlands is often high in soluble reactive phosphorus (SRP) and low in dissolved oxygen. In the Shingle Creek watershed, where nearly all of the remaining wetlands are highly disturbed and altered, these high concentrations of SRP can negatively impact downstream waterbodies. This SRP Reduction Project targets two high-priority locations to test and implement Best Management Practices (BMPs). The two locations are the outlet of wetland 639W in Crystal, just upstream of Upper Twin Lake, and the Cherokee Wetland, south of Cherokee Drive on Bass Creek in Brooklyn Park.